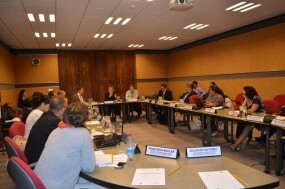 On 24-25 March 2015, a regional workshop on the “EQuIP – Enhancing the Quality of Industrial Policies” project was held in Santiago de Chile. The workshop was organized by the United Nations Industrial Development Organization (UNIDO) and the German Federal Enterprise for International Cooperation (GIZ) in collaboration with the Production Development Corporation of Chile (CORFO) and the United Nations Economic Commission for Latin America and the Caribbean (ECLAC). This event was hosted by ECLAC and served to raise awareness on EQuIP amongst representatives from selected Latin American countries, including Chile, Colombia, Costa Rica, Ecuador, Paraguay and Uruguay. The event targeted country representatives engaged in industrial policymaking, industrial strategy formulation or industrial analysis with higher levels of seniority. The audience included participants occupying positions such as vice-minister, director or high-level advisors. The event aimed at discussing the relevancy of EQuIP for their countries’ industrial policy process and how it could be best tailored and operationalized in their specific country context. It also aimed at getting a better understanding of the actual needs of governments in Latin American countries with regard to evidence-based industrial policy-making. It served to identify and assess some of the areas where the need for capacity-building is most pressing which, in turn, will eventually help to further refine the EQuIP package and tailor it to the requirements of its users. Methods for obtaining, processing and analyzing data to assess countries’ current industrial performance and establish baselines for continuous monitoring of industrial interventions.